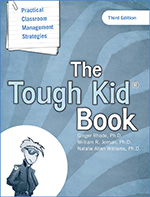 Buy The Tough Kid Book and The Tough Kid Toolbox together and save! In The Tough Kid Book (2nd ed. ), you will earn how to structure your classroom to ensure success for Tough Kids and use proactive, practical techniques for managing difficult students. This second edition features an all-new chapter on returning Tough Kids to the general education classroom and includes the Teacher Pleaser Social Skills and Teacher's Expectation programs.